There is a clear link between the level of corruption in a country and people’s attitude to corruption. If you shrug your shoulders and accept there’s little to be done, corruption remains high and you are unhappy. If corruption makes you angry and you do something constructive about it, like pass laws and prosecute the corrupt, there is less corruption, better economic conditions and more happiness. That’s the message we are trying to get across in Ukraine with campaigns and publicity because as things stand, there’s a high tolerance of corruption in Ukraine, economic freedom is low, too many people are unhappy and corruption continues to flourish. 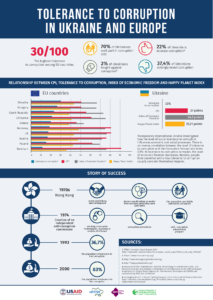 At Transparency International Ukraine we compared the scores of Transparency International’s Corruption Perception Index, which measures the perceived levels of public sector corruption in a country, with the Index of Economic Freedom, the Happy Planet Index and the level of tolerance of corruption in ten European countries. The results show that the more tolerant of corruption people in a society are, the lower the country scores on the Corruption Perceptions Index. As tolerance of corruption increases, the level of economic freedom decreases confirming that corruption hurts growth and prosperity. Additionally, the results illustrate a link between intolerance of corruption and happiness: People from countries with a low tolerance of corruption usually consider themselves happier. This demonstrates how important it is for people to stop tolerating corruption in their societies. Countries that have success at tackling corruption use a combination of legislation, punishment of corrupt officials and intolerance of corruption. They understand that corruption harms everybody; it is unacceptable. For the past three years Transparency International Ukraine has produced information campaigns aimed at changing people’s attitude to corruption. After we launched our “Corruption kills” and “It is not shameful to whistleblow” campaigns we polled over 10,000 people and found that 45.5 per cent declared that they were ready to blow the whistle on corruption after seeing our campaigns. 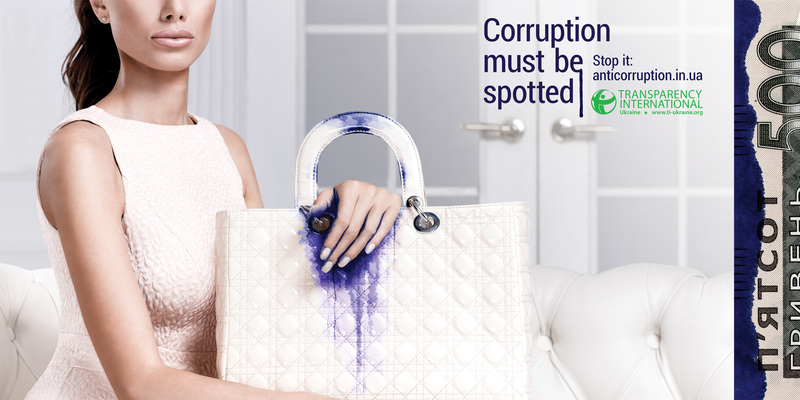 This year we started a campaign called “Corruption must be spotted”. 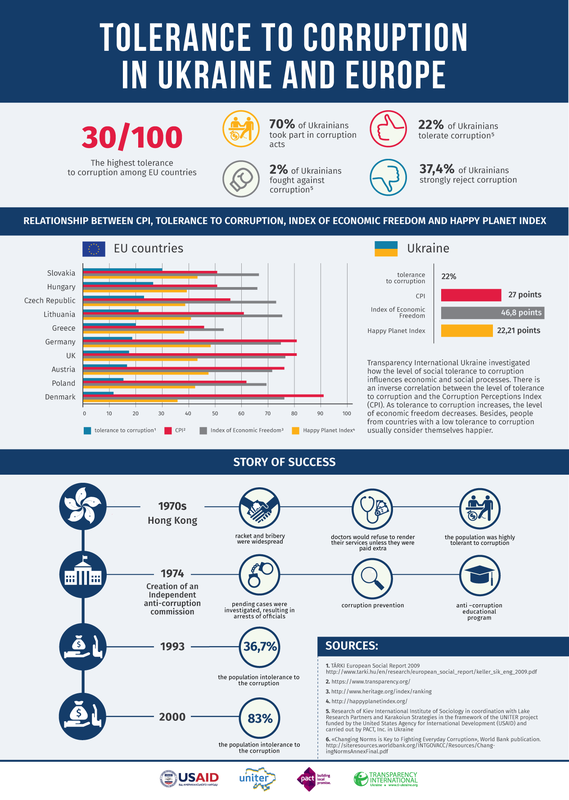 Although many Ukrainians say they are intolerant of corruption, in the next breath they admit to paying bribes to get things done. Our campaign is aimed at tackling this double standard by showing the effects of corruption. We use posters, radio spots and cartoons. ← Does Ukraine merit a new handout?